Chico Ryder went through 28 radiation sessions for a rare form of cancer. But, when he began cannabis treatment, things improved dramatically. After a cancer diagnosis in 2012, Chico Ryder spent weeks in the hospital under intensive treatment. The conventional methods wreaked havoc on his body. But, once he began cannabis treatment, things began to change. Now, Chico grows his own medicine. Here’s how cannabis helped this teenager overcome cancer. Chico endured more pain and hardship than most people will ever experience in their entire lives. He had to be hospitalized each time he received chemo. The treatments forced him to rely on a feeding tube and a wheelchair. After all of that pain, Chico’s family was desperate to find something to help him through the process. So, they turned to cannabis oil. Chico took an aggressive approach with cannabis treatment. He worked up to somewhere near 900mg of THC extract and 500 CBD extract daily. Yet, once he began treatment, he was able to get off of all opiate pain medications. The cannabis oil quickly reduced his nausea and halted the progression of neuropathy, while also enabling him to wean off intravenous nutrition and opiates. Cannabis, Smith believes, saved her son’s life. Chico, now 14, has been in remission for over two and a half years. He still takes cannabis oil daily, but his doses have decreased dramatically. He now takes 85mg of THC and 100mg of CBD. He also takes nine other supplements, including mushroom powders and weekly mistletoe injections imported from abroad. 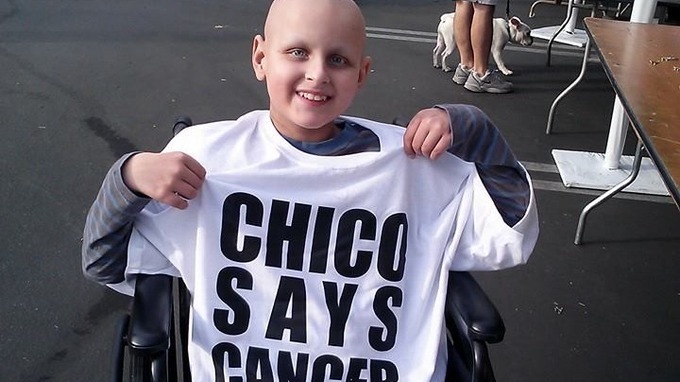 There’s no doubt that Chico’s battle with cancer has been extremely trying. His cancer is gone, but he will need to watch out for return over the next two years. Chico goes in for a checkup every six months to scan for more cancer. In this time since his hospital stays, the teenager has decided to take his health into his own hands. He now grows his own cannabis. The fresh flower he cultivates is given to Aunt Zelda’s Bay Area collective. The collective takes the materials and turns it into medical cannabis oil. He hopes any excess medicine goes to helping other cannabis patients in need. Chico and his family are on a mission to spread the word about medical cannabis. They are currently fundraising for a film about his experience. The film is available for presale in a Go Fund Me campaign. The proceeds would go toward Chico’s building medical expenses as well as his budding philanthropic efforts. You can donate to Chico’s project here.